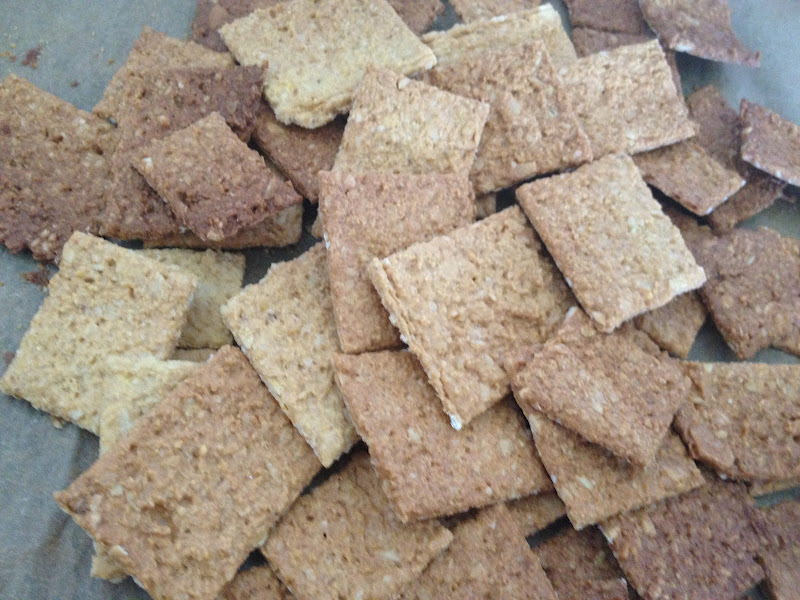 I learned how to make crackers at my cooking class at the Natural Gourmet Institute and now I make them all the time. They go fast! The original ones are flavored with cumin (which I leave out) and are not gluten-free so I substitue chickpea flour. Serve with hummus or chopped lentils or just eat them straight up. Preheat oven to 350. In food processor, grind oats, nuts, flour, and cornmeal to a fine meal. Roll out the dough with a rolling pin between 2 sheets of parchment paper, about 1/8″ thick. Each time the shape of the dough rolls out looking like a different continent, but most of the time Africa. Cut the dough with a pizza cutter to make individual square crackers. Place the bottom parchment with the dough on a baking sheet. Bake until golden and crispy, about 20 minutes. The edges always get darker than the center. Let them cool and then break them up (as pictured) before serving. Enjoy!